Introduction: Employees are regularly offered opportunities to make their work more appealing and rewarding. These opportunities might be as simple as making fine changes to their daily tasks to boost happiness and to connect with more people at vocation. Hence, an attempt is made to assess job-crafting behavior among the dental academic faculty. Materials and Methods: A cross-sectional study was conducted among dental academic faculty from five dental colleges. Job Crafting Questionnaire (JCQ) was used to assess the job-crafting behavior. Mean scores were calculated for different domains of JCQ. Gender differences were analyzed using Student's “t-” test and one-way ANOVA to test the difference between different academic positions of the faculty members. 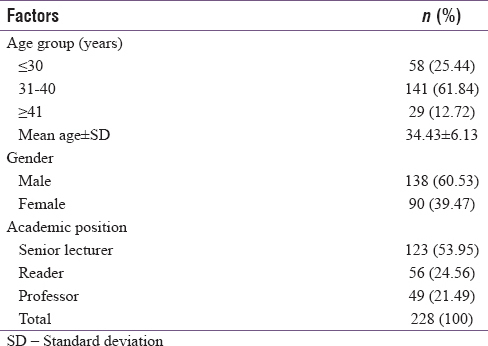 Results: A total of 228 dental faculty members with a mean age of 34.43 ± 6.13 years participated in the study. The mean value of job-crafting behavior was found to be highest among female faculty (60.07 ± 8.38) and professors (61.35 ± 8.30). Male faculty scored higher in task-crafting domain and female faculty scored higher in both cognitive- and relational-crafting domains. The professors scored highest in all the three domains of job-crafting behavior as compared to that of senior lecturers and readers. Conclusion: Job crafting is an effectual workplace intervention, where employees assume an active role in shaping their work experience to enhance their job satisfaction and well-being. The overall score of job-crafting behavior was found to be highest among both professors and female faculty members. Male faculty members scored higher in task-crafting domain. With regard to individual domains, the participants scored highest in cognitive crafting followed by task and relational crafting. Thus, job crafting is a beneficial trait that improves job satisfaction and well-being of the employees and has received only a modest attention,, particularly there is no published research on job crafting among the medical and dental faculty till date. Dental professionals working as academicians have many tasks to perform at work. They need to interact with their colleagues and to feel the impacts of this in their lives and that of others. With this background, the present study was conducted with an aim to assess job-crafting behavior among the dental professionals working as academicians and to assess whether there is any difference based on gender and academic position of the dental faculty. This cross-sectional questionnaire-based study designed for all the teaching dental faculty working in dental colleges received its ethical clearance from the Institutional Ethics Research Committee (MDC_R_088182). The study was carried out for 3 months (July 1, 2016–September 31, 2016). The questionnaire consisted of two parts (Parts A and B). Part A collected the information on demographic characteristics and Part B consisted of Job Crafting Questionnaire (JCQ) developed by Slemp and Vella-Brodrick. The JCQ consists of three domains [Table 1] with 15 questions where 5 questions are allotted to each domain. All the questions were answered on a 6-point Likert scale (1 = hardly ever to 6 = very often). The questionnaire was tested for content and face validity by a panel of “experts” and no modifications were made. A pilot study was conducted on a sample of thirty faculty members who were not included in the main study and the split-half coefficient obtained was 0.8838. Cluster sampling technique was used to select the sample. The sample size estimated was 222 with consideration of a 5% precision and 95% confidence interval and it was rounded to 230. Five dental colleges were selected randomly from the states of Andhra Pradesh and Telangana and the entire teaching faculty working in these colleges was invited to participate in the study. After explaining the rationale of the study, the questionnaires were distributed to those who were willing to participate and gave verbal consent. The participants were promised of confidentiality and were requested to provide accurate information without any prejudice. The completed questionnaires were collected in the evening before the college ended. Statistical analysis was performed using SPSS software (IBM Corp, Released 21, Statistics for Windows, version 21, Armonk, NY, USA). Descriptive statistics were calculated. The mean and standard deviation of each domain were calculated separately, and the mean value of total job-crafting behavior was computed. Significant difference was tested using t-test and one-way ANOVA considering P < 0.05 as statistically significant. A total of 228 dental faculty members participated in the study out of 252, yielding a response rate of 90.4% with a mean age of 34.43 ± 6.13 years. Majority (60.53%) of the faculty members were male. Among the total participants, 123 were senior lecturers and 49 were professors [Table 2]. The mean value of total job-crafting behavior of all participants was 59.56 ± 8.10. With regard to individual domains, they scored higher in cognitive crafting (20.06 ± 3.97) followed by task and relational crafting [Table 3]. Results revealed that overall job-crafting behavior was nonsignificant (P = 0.45) between males and females, but females scored higher on overall job-crafting behavior (60.07 ± 8.38), cognitive crafting, and relational crafting. However, male employees scored high on task-crafting behavior (19.86 ± 2.96, P = 0.70) [Table 4]. Results revealed that overall job-crafting behavior was nonsignificant based on academic position. However, the results indicate that professors do show a high trend toward overall job-crafting behavior (61.35 ± 8.60, P = 0.20), task crafting, cognitive crafting, and relational crafting [Table 5]. Job crafting captures what employees do to revamp their own jobs in ways that can promote job satisfaction, as well as engagement, flexibility, and thriving work; dental fraternity is no exception in this regard. Thus, the present study assessed the three domains of job-crafting behavior of dental faculty working in various academic institutions in the states of Andhra Pradesh and Telangana. For better comprehension, each domain of job crafting is discussed in the following sections separately based on gender and academic position of dental faculty. Task crafting refers to making changes in the number or kind of activities one completes on the job (e.g. introducing new tasks that better go well with one's skills or interests). The first and foremost element in task crafting is adding tasks which affix meaning to their current job, followed by emphasizing tasks by allocating more time and energy to tasks that they see as meaningful that are already part of their jobs and, finally if the job demands to redesign, they re-engineer the existing task to make it more meaningful. The results of the current study on task crafting were statistically nonsignificant, i.e. both male and female participants are proactive in using new approaches to improve the work. However, literature emphasized that, although both men and women had similar work outlook, a difference existed in their work experience, i.e., males worked more hours, saw more patients, and earned more.,, Gender differences in socialization practices also reflect adult role anticipations that “women are mothers and men are workers.” The present study revealed that men scored high when compared to women employees. This can also be explained based on role designation to a male or a female. Although there is a first-rate representation of women in dentistry, still they are underrepresented in provisos of wage and promotion. Even in the administrative positions of dental colleges, the number of women is much lesser when compared to men, i.e. 11% and 5% were women principals and vice principals, respectively, and also the percentage of women embracing leadership cadres in university, dental council senate, and other professional bodies is low. This represents the glass ceiling effect, which means “the higher the fewer.” It was also noted that participation of women in leadership aspects in the dental organization is low. Men are more likely to strive for power in the workplace than women who tend to be more motivated by association–the wish for warm, close relationships with others. Women are also susceptible to undesirable working conditions., Female dentists' working hours showed a distinct plunge as soon as they begin family.,,, It was also reported that working time was abridged by 7 h/week, but it did not have any brunt on men  and they have a split in their vocation for more than 6 months as compared to males due to parenthood concerns. Further research is required in this regard and the above-mentioned reasons might explain to some extent why male faculty members scored higher in task crafting. Cognitive crafting is distinct from task crafting as it involves altering how one “sees” one's job, with the view to making it more individually meaningful (e.g., making an effort to be familiar with the effect one's work has on the triumph of the organization or community). It also refers to improvements in meaningfulness that can happen from employees shifting how they reflect/perceive about the tasks, relationships, or jobs in total. i.e., by tapering their mental scope of the purpose of their job on explicit tasks and relationships that are noteworthy or helpful to them. Finally, by linking their perceptions, they can craft their job by taking advantage of the existing components of their jobs by drawing intellectual connections between definite tasks or relationships and interests, outcomes, or aspects of their identities that are meaningful to them. The mean value of this domain was found to be highest in the female faculty when compared to their male counterparts though the difference was not statistically significant. It could be because of various reasons. First, the dental profession was male subjugated until the 1970s, but slowly it started providing a sizeable platform for females as demonstrated, i.e. 50% of the dental workforce being women. Second, particularly in the Indian scenario, nearly 60% of the dental undergraduate students are females  and it is increasing progressively. Research states that gender issues and issues relating to responsibility of the women in dentistry are universal and, in many countries, the percentage of women in the dental profession is elevated than that of men and there is significant boost of female dental faculty members over a 10-year period. In addition, women in dental profession seek independence and want to be judged by their own intrinsic worth and seek equal recognition for their equal achievements. Considering all the cited reasons where females play an important role in dental education and profession, it is evident why they scored higher in cognitive crafting and it demands further research. Relational crafting involves exercising discretion about whom one networks with at work (e.g., making friends with people with similar skills or interests). Crafting relations can facilitate meaningfulness at work through building relationships, i.e., they can craft their jobs to derive meaningfulness by forging relationships with others who will add a sense of pride, dignity, or worth. Employees can craft their work relationships by reframing the nature of the relationship to be about a new, more meaningful purpose which may produce more high-quality connections (term connections denote short, momentary interactions with others that could evolve into or contribute to a long-term relationship) with others and add meaning to their relation. Finally, by adapting relationships, they can craft their existing relationships to nurture significance to their jobs by providing priceless assistance and support to peers in executing their jobs, thus persuading them to do the same in return. These adaptations are likely to intensify and fortify the relationships through mounting levels of mutual conviction, optimistic regard, and vivacity. In the current study, female faculty members scored higher in this domain as compared to males, which was statistically nonsignificant. This could be explained on the basis that females exhibit more caregiving attitude based on the evolutionary theory of parenting. Research revealed that females are more likely to build up an interpersonal relationship and to offer emotional support than males. It is evident that women are more amenable than men are to social signals, an attribute that contributes to better understanding. Women also take pleasure in getting in touch with people, and female dentists are more empathetic and demonstrate fine communication skills. The traits of women explained above can elucidate to some extent why they scored higher in relational crafting. To recognize the foundation of the differences between male and female faculty members' perception toward the domains of job crafting is far off from the range of the current research. Our findings may be the consequence of biological gender disparity or personal experiences that have developed in reaction to cultural norms and gender-based favoritism, or both as people discover how to think and act based on their experiences, observations, and dealings in the world. Therefore, it is very vital to note that the results of our study are only expressive, not dictatorial. Professors scored highest in all the three domains of job crafting, as compared to readers and senior lecturers. It was cited in the literature that managers working in an organization have a high scale of autonomy and authority, which allows a substantial space to craft their jobs. Such crafting will have an effect on employees working under them and allows these employees to craft their jobs which are valuable to the organization. The above-explained reason can be applied to the professors who have the autonomy to craft their jobs as it is proved that, the higher the degree of autonomy and discretion, the greater is the prospect to craft the job. Research also states that job crafting has a positive relation for individuals with higher skills and these skills are likely to be associated with job autonomy. As professors are expected to have more skills as compared to readers and senior lecturers based on their academic experience, the organization also in turn lends more emancipation to those having higher task complexity. Based on the above-cited reasons, job autonomy, a crowned feature of professors which is a precondition for the act of job crafting, might have led professors to score higher in all the three domains of job crafting compared to their junior faculty members. The junior faculty members should observe and learn the art of crafting from their seniors and reach great heights. Further research is required in this regard. As the research sample was restricted to dental faculty, results cannot be generalized to other health professionals, which demands further research. The voluntary participation of the dental faculty might have skewed the results. The use of self-reported instrument could have led to responding bias. Job crafting is a form of proactive behavior; it is an effective workplace intervention where employees take an active role in initiating changes to the physical, cognitive, or social features of their jobs. The present study indicates that, irrespective of gender and academic positions, employees use new approaches to improve their work, introduce new work tasks, choose to take additional task at workplace, believe in hardwork, and maintain good relations at workplace, which play a significant role in organizational success. Job crafting is not a one-time affair and individuals employ in it over time; more research is required in the dental scenario as there is lacuna in the literature. Other aspects such as work engagement, job autonomy, effect of well-being of an individual, and role of organization such as organizational politics, workload distribution, and task delegation on job crafting should be taken into consideration in future research. Sinclar J. Collins Cobuild Advanced Learner's English Dictionary. 5th ed. Harpercollins Publishers, Great Britain; 2006. p. 326, 777. Wrzesniewski A, Dutton JE. Crafting a job: Revisioning employees as active crafters of their work. Acad Manag Rev 2001;26:179-201. Slemp GR, Kern ML, Vella-Brodrick DA. Workplace well-being: The role of job crafting and autonomy support. Psychol Well Being 2015;5:7. Slemp GR, Vella-Brodrick DA. The Job Crafting Questionnaire: A new scale to measure the extent to which employees engage in job crafting. Int J Well Being 2013;3:126-46. Berg JM, Dutton JE, Wrzesniewski A. What is Job Crafting and why does it Matter. Retrieved from the website of Positive Organizational Scholarship; 2011. Available from: http://positiveorgs.bus.umich.edu/wp-content/uploads. [Last accessed on 2018 Jan 15]. Grant AM, Ashford SJ. The dynamics of proactivity at work. Res Organ Behav 2008;28:3-4. Grant AM, Parker S, Collins C. Getting credit for proactive behavior: Supervisor reactions depend on what you value and how you feel. Pers Psychol 2009;62:31-55. Seibert SE, Kraimer ML, Crant JM. What do proactive people do? A longitudinal model linking proactive personality and career success. Pers Psychol 2001;54:845-74. Thompson JA. Proactive personality and job performance: A social capital perspective. J Appl Psychol 2005;90:1011-7. Berg JM, Dutton JE, Wrzesniewski A. Job crafting and meaningful work. In: Dik BJ, Byrne JZ, Steger MF, editors. Purpose and Meaning in the Workplace. Washington, DC: American Psychological Association; 2013. p. 81-104. McKay JC, Quiñonez CR. The feminization of dentistry: Implications for the profession. J Can Dent Assoc 2012;78:c1. Kaldenberg DO, Becker BW, Zvonkovic A. Work and commitment among young professionals: A study of male and female dentists. Hum Relat 1995;48:1355-77. Whitehead C, Williams C, Eccles JD. Women dentists in Wales. J Dent 1997;5:107-12. Mathieu PS, Sowa CJ, Niles SG. Differences in career self-efficacy among women. J Career Dev 1993;19:187-96. Pallavi SK, Rajkumar GC. Professional practice among woman dentist. J Int Soc Prevent Communit Dent 2011;1:14-9. Nagda SJ. Harmonizing professional, personal, and social responsibilities: Indian women dentists' perspectives. J Dent Educ 2015;79:S23-6. Tandon S, Kohli A, Bhalla S. Barriers to leadership positions for Indian women in academic dentistry. Int Dent J 2007;57:331-7. Reed MJ, Corry AM, Liu YW. The role of women in dental education: Monitoring the pipeline to leadership. J Dent Educ 2012;76:1427-36. Gino F, Wilmuth CA, Brooks AW. Compared to men, women view professional advancement as equally attainable, but less desirable. Proc Natl Acad Sci U S A 2015;112:12354-9. Bejerot E. National Institute for Working Life Department for Work and Health. Arbeteoch Hälsa. Dentistry in Sweden-Healthy Work or Ruthless Efficiency? Lund University, Department of Dental Public Health, Center for oral Health Sciences: 1998. p. 14. Ayers KM, Thomson WM, Newton JT, Morgaine KC, Rich AM. Self-reported occupational health of general dental practitioners. Occup Med (Lond) 2009;59:142-8.
de Wet E, Truter M, Ligthelm AJ. Working patterns of male and female dentists in South Africa. J Dent Assoc S Afr 1997;52:15-7. Ashri NY, Al Ajaji N, Al Mozainy M, Al Sourani R. Career profile of dentists in Saudi Arabia. Saudi Dent J 2009;21:28-36. Smith MK, Dundes L. The implications of gender stereotypes for the dentist-patient relationship. J Dent Educ 2008;72:562-70. Ayers KM, Thomson WM, Rich AM, Newton JT. Gender differences in dentists' working practices and job satisfaction. J Dent 2008;36:343-50. HariPrakash VP, Mathur RD, Jhuraney B. Dental workforce issues: A global concern: J Dent Educ 2006;70:22-6. Babar MG, Omar H, Lim LP, Khan SA, Mitha S, Ahmad SF, et al. An assessment of dental students' empathy levels in Malaysia. Int J Med Educ 2013;4:223-9. Magalhães E, Salgueira AP, Costa P, Costa MJ. Empathy in senior year and first year medical students: A cross-sectional study. BMC Med Educ 2011;11:52. Annam A, Ali M, Muhammad H. Impact of job autonomy on work engagement: The mediating role of job crafting in universities of Pakistan. Int J Manag Sci Bus Res 2013;3:31-44.